After five years of protests, demonstrations and strikes, Greek citizens voted to throw off five years of crushing austerity. Their victory has emboldened populist parties across Europe, and should inspire Americans to resist austerity here at home. 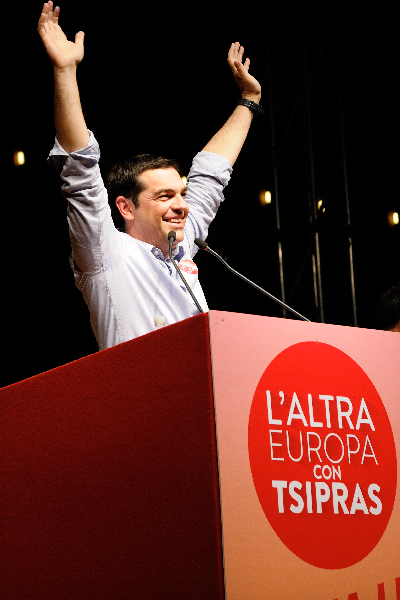 The victory of Greece’s leftist anti-austerity Syriza party, and Alexis Tsipiras’ ascension to prime minister ushers in a government that will push back against the austerity measures devised by the troika of Greece’s international creditors and the International Monetary Fund, and accepted by the country’s economic elite, after the crash of Greece’s economy in 2009. Greece’s new leaders left little doubt about their intentions as they celebrated victory. ~ Yanis Varoukis, Greece’s new prime minister, on Greece’s oligarchy. The International Monetary Fund assumed the Greek government could impose austerity without significant impact on economic growth and unemployment. In fact, the IMF assumed Greece’s economy would grow as a result of the 2010 aid package, for which the troika and the IMF demanded austerity measures. The results were disastrous. Greece’s economy shrunk by 25 percent, and wages dropped about the same amount. Along with shrinking the economy, austerity increased Greece’s national debt. Unemployment has reached depression levels. Overall unemployment is at 28 percent. Youth unemployment stands at 60 percent — even after the government lowered the minimum wage for youth by 32 percent, to encourage job creation. Wealthy Greeks got off scot-free. Cocooned in suburbs, austerity cuts didn’t touch them until mid–2013, when the government ruled that wealthy Greeks were no longer entitled to free police bodyguards. Since 2009, businessmen and journalists threatened by anarchist groups received personal police protection. The burden of austerity cuts fell mostly upon middle- and working-class Greeks. Three million Greeks are living on or below the poverty line. Nearly every family has suffered. Many have survived by queuing up at soup kitchens, and scavenging rubbish bins for food. Austerity devastated the health of Greece’s economy and its people. The national health budget was cut by 40 percent. As a result, 35,000 doctors, nurses, and other health workers lost their jobs. Hospitals lack basic supplies and enough staff. Infant mortality went up by 40 percent. Stillbirths are up 21 percent, as a result of cuts to prenatal service. HIV infections rose more than 200 percent due to increased IV drug use and cuts to needle exchange programs. Austerity drove some Greeks from desperation to despair. Suicide deaths in Greece increased 45 percent between 2007 and 2011, driven mostly by a rise in suicides among men. According to one analysis, every one percent fall in government spending led to a 0.43 percent increase in suicides among men. Men between the ages of 45 and 89 face the highest suicide risk, because they are most likely to have their salaries and pensions cut. Since the financial crisis, conservatives have warned Americans that we’re in danger of becoming Greece, unless we submit to the austerity Greeks are rising up against. Unlike Greece, America has only experienced what Paul Krugman calls “de facto austerity,” due to Republicans in Congress blocking any measures that might help the economy. Sequestration was another taste of the kind of austerity conservatives want to impose. The new Republican Congress will almost certainly try to subject Americans to the kind of austerity that Greeks have suffered. House Budget Committee chair Tom Price has already proposed measures that would cut the federal workforce by over 400,000, leading to the loss of even more jobs — mostly in the private sector — supported by the economic activity of federal employees. Price’s proposed “reforms” to Social Security, Medicare and Medicaid are really cuts that would devastate those programs and the Americans who depend upon them. The fight against austerity in Greece has only just begun. Greece’s creditors will insist on more punishing austerity. In the next two years, the fight here at home will intensify. Syriza’s victory reminds us that progressive, populist, people-powered movements can win — if they just keep fighting.